For many, running a half marathon is a tremendous physical endeavor. It requires time and a lot of mental and physical training to be able to finish the 13.1-mile race. For parents of children with disabilities, there is a significant time commitment and both physical and mental stress with little to no breaks. Team Hope – the fundraising team of Friends of Hope Academy – is hoping to raise enough money to support sending the students of Dame Marjorie Bean Hope Academy to camps during the school breaks by encouraging people to take up the challenge of running the Bermuda Day Half Marathon Derby and raise funds. The charity Friends of Hope Academy was started to support programming and equipment needs for the government school that isn’t covered by the government funding the school receives for their students who range in age from 4 to 18 with multiple challenges that are both physical and cognitive. “One of the primary focuses for Friends of Hope Academy is to help families with respite solutions,” said Julie Lynn, who is on the charity’s board and is the school’s social worker. “Bermuda, unfortunately, doesn’t have any respite options for kids under the age of 18 with special needs, and it can be challenging for parents. 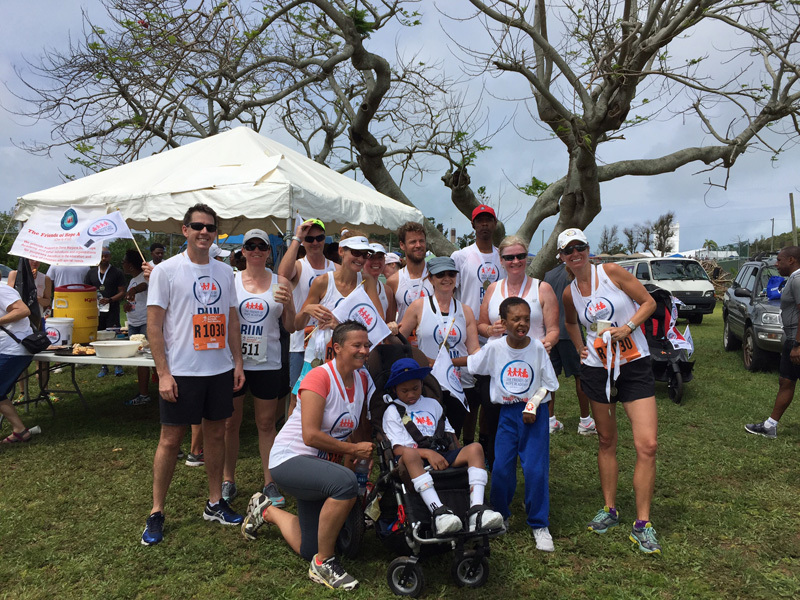 All of the funds raised by Team Hope by running the Bermuda Day Half Marathon go back to support the students and families of the school. The school recognizes the same holidays as other public schools, and the funds have gone towards funding an Easter and Christmas camp held at the school for several years. It also helps to subsidize sending the students to a camp that is offered by WindReach during August. In the past, Team Hope raised enough funds to send the students to specialized overseas residential camps that were geared toward children with physical and developmental needs. However, because funds have dropped off in recent years, the charity decided to focus on providing local camp options. “We really wanted to be able to reach as many families as possible, even though it was a tough decision,” said Ms Lynn. 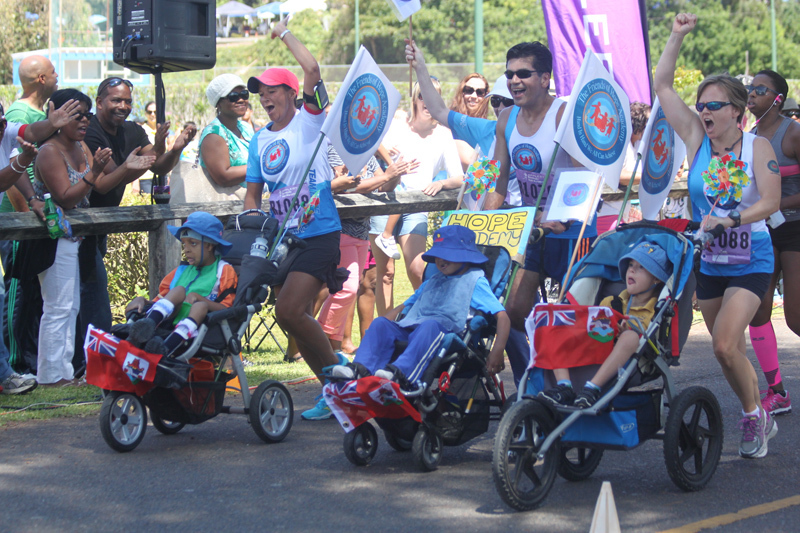 The Bermuda Day Half Marathon Derby is the charity’s largest fundraiser of the year, and along with runners who take on the challenge of running the entire race, there is also a relay team, as well as a team of students from the school who join in the competition. Team Hope participants wear t-shirts purchased with the help of sponsors that “lend a great visual” said Ms Lynn, but not everyone knows what’s behind the t-shirt and the name. “Having our students participate makes it clearer and brings some community awareness to the spectators about what Team Hope is about,” she added. Team Hope also manages a refreshment tent at the end of the race, mostly led by families of students from the school. The tent is available for all runners, and not just those running for Team Hope. Volunteers provide baked goods and sponsors such as Pure Water, Barritts, Lindo’s and Butterfield & Vallis donate fruit, water and refreshments. Along with looking for runners to fundraise under the Team Hope banner, the charity is also in need of volunteers to help with setup and prep work for the finish line tent. Anyone interested in registering with Team Hope can sign up through the official race event here and then sign up to be a member of Team Hope. All information for signing up to be part of Team Hope can be found here, including the option to donate directly to the charity. Anyone looking to participate in the race that isn’t able to put together a relay team, can also find information on the Friends of Hope Academy website on how to participate. 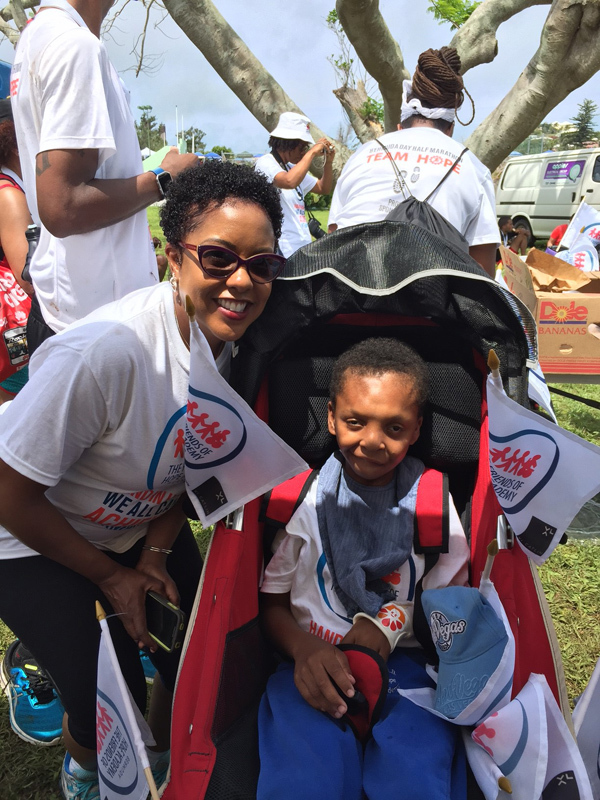 “We encourage everyone that if they do want to run for us, we really do appreciate if they can get sponsors because it is great to run and wear a t-shirt and raise awareness, but it’s the funds that we’re really counting on at the end of the day,” said Ms Lynn. The 2018 Bermuda Day Half Marathon Derby will take place on Friday, May 25 starting in Somerset. For more information about the race, or to sign up, follow here. Do ensure that the WINNER is a BORN BERMUDIAN, even if the first BERMUDIAN TO CROSS THE LINE IS IN 5TH PLACE. It is Bermuda Day. keep the Bermudian hope ALIVE.